Bonnaroo, our love affair continues. Despite the inconveniences one would expect with a festival of this magnitude, smiling faces abound here on the 600 acre farm in Manchester, Tennessee, where the townspeople have quickly learned what to expect when throngs of music lovers flock to their town of just over 8000 inhabitants. 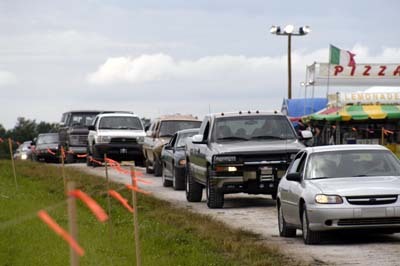 Although many route changes were implemented to reduce traffic congestion, there were again reports of patrons waiting in line for up to and over twelve hour periods. Parking was readily available for those who chose to arrive as early as 7:00 on Wednesday night, which surely couldn�t have slowed things down, and most definitely aided local law enforcement with any problems which may have arisen, should they have opted to leave a multitude of folks with nowhere to go floating around town. Nonetheless, the numbers of fans quickly overcame the available entrances, and some travelers arriving as early as 8:00 A.M. on Thursday found themselves waiting until late evening to set up camp, while others arriving at the same hour were lucky enough to be parked by noon. This being said, it did appear that the new parking system, which included double the number of tollbooths from last year, enabled a quicker entry for the greater number, and the majority of the parking procedure was completed much sooner than it was last year, all resulting in that many more dancers for the four bands playing the late night tents on Thursday night, with Louque kicking off the festival�s music at 10:00. With 26 bands playing on six stages Friday alone, there were obviously choices to be made. Visitors to Setlist.com will find themselves familiar with bands like Yonder Mountain String Band and Ekoostik Hookah, and names like Jack Johnson (with a three song assist from his buddy G.Love) and Neil Young may ring a bell, but have you checked out the mournful ballads of My Morning Jacket from Louisville, Ky. or the always powerful yet sweet voice of Lucinda Williams? One thing is for sure; it was going to be hard to make a bad choice. For the setlists of our listed bands, including funky Meter�s late night show on Friday, don�t forget to check below. Pedestrian traffic continued to flow a little easier on Saturday, with some new, sometimes impromptu, gateways being established in this year�s new fencing system. The chain link barrier, apparently erected to help ease the automobile traffic flow, greatly hindered the ease with which those on foot moved through the farmland initially, but the pattern to and from campgrounds and venues normalized shortly. The mud which lingered from the previous week�s rain was contained and covered for the most part, with the aid of straw (and enough sand to create a springy beach in front of �Which Stage�), but not enough to keep it from being a regular, though slight, nuisance for most, and an opportunity for a mud dive or bath for others. Thus far, additional rain has been insignificant, with a gentle steady sprinkle on Saturday night after the Widespread Panic show serving to keep the dust on the few gravel roads to a minimum. Perhaps the most significant change for the 80,000 ticket holders this year was one in the general layout, involving those wishing to enter the new �Centeroo� to display their festival wristbands and offer their bags to be searched for seemingly only the most dangerous of items. Once inside however, all were able to move freely from venue to venue, food booth to vendor booth, cyber caf� to playground. The arcade in the much larger �Centeroo� this year included a stage for the occasional DJ, such as DJ Spooky of New York, to scratch their vinyl, as well as the familiar assortment of video games from days gone by. This stage seemed to be greatly appreciated by the relative few who could squeeze their way in to the small area in front of the stage, while emotions of those who were trying to enjoy the nearby �This Stage� ranged from annoyed to much more annoyed with the intruding sounds. Game players who found their virtual retreat invaded also thought there might be a better choice of location for this particular musical expression. A portion of the 39 miles of electrical cable and the 176 telephone lines being employed at Bonnaroo this year were devoted to the AOL powered cyber caf�, which once again offered the opportunity for visitors to check and send their e-mail, as well as to burn a custom CD, choosing from songs offered by this years performers. Sunday presented yet another difficult roster of acts to choose from, including Galactic, moe., and the legendary James Brown, with the festival�s music ending where this website began; with The Dead, who performed their second show with this version of the post-Jerry era reunions. Again, continue on for setlists and comments. Those who remembered the lines of vehicles waiting to exit last year were probably surprised to see the lack of such activity on Sunday night, as most of the campers chose to hang around longer, letting the party continue well into the new workweek (for some of us). When the time to leave did come, some of those departing found the addition of a new on-ramp to the interstate directly from the farm an added convenience, making many parting impressions favorable ones. With the disappointing cancellation of Bonnaroo NE, we�ll be anxiously awaiting next summer for what has quickly become the premier musical event in the country. There have been 28 shows in the last 7 days. This show has an average rating of 4.66 out of 203 votes. This show has an average rating of 4.02 out of 56 votes. Lineup: Art Neville - keyboards, vocals. George Porter Jr - bass, vocals. Brian Stoltz - guitars, vocals. Russell Batiste Jr - drums. This show has an average rating of 4.81 out of 118 votes. This show has an average rating of 4.27 out of 144 votes. This show has an average rating of 4.33 out of 12 votes. Comment: (1) this was cool and very funny. Has keller covered this theme song before? This show has an average rating of 4.60 out of 154 votes. This show has an average rating of 4.65 out of 26 votes. This show has an average rating of 4.51 out of 381 votes. This show has an average rating of 4.90 out of 48 votes. This show has an average rating of 4.38 out of 52 votes. This show has an average rating of 4.44 out of 161 votes. This show has an average rating of 4.08 out of 53 votes. Lineup: Emmylou Harris & Spyboy: Emmylou Harris - vocals, guitar. Buddy Miller - guitar, Mandolin, vocals. Tony Hall - bass, vocals. Brady Blade - drums. This show has an average rating of 4.84 out of 86 votes. This show has an average rating of 3.23 out of 13 votes. This show has an average rating of 4.44 out of 18 votes. This show has an average rating of 4.78 out of 180 votes. This show has an average rating of 4.62 out of 37 votes. This show has an average rating of 4.81 out of 143 votes. This show has an average rating of 4.66 out of 143 votes. This show has an average rating of 3.65 out of 674 votes. This show has an average rating of 4.54 out of 114 votes. This show has an average rating of 2.96 out of 67 votes. This show has an average rating of 4.62 out of 341 votes. Lineup: Luther Dickinson - vocals, guitars. Cody Dickinson - drums, Washboard, guitar, vocals. Chris Chew - bass, vocals. Duwayne Burnside - guitar, vocals. This show has an average rating of 4.30 out of 20 votes. This show has an average rating of 4.14 out of 867 votes. This show has an average rating of 4.26 out of 39 votes. This show has an average rating of 4.61 out of 154 votes.